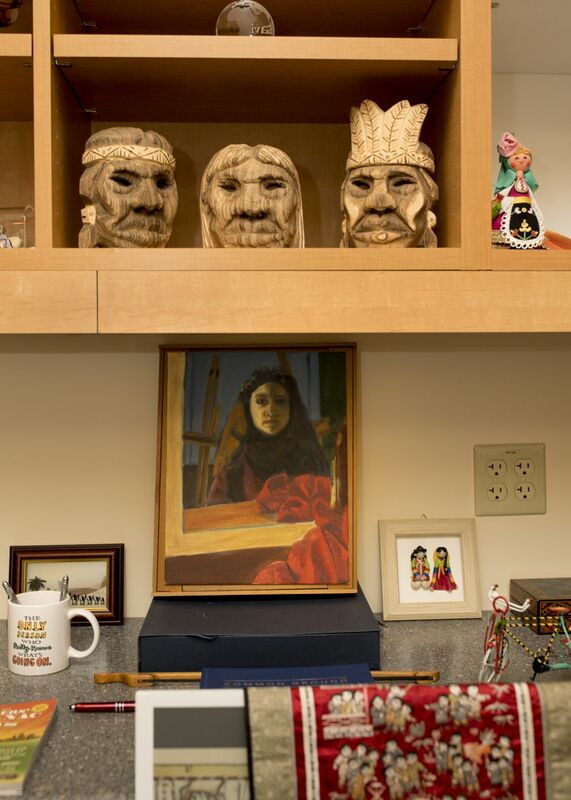 James Reese has a museum’s worth of gifts in his Roger Williams Hall office, all from Bates students he’s mentored during his 40 years as a Bates dean. Seeing an office filled with objects often prompts visitors to ask, “What’s your favorite item?” But Reese doesn’t like to pick out just one, preferring to share why and how students offer him various tributes. Take the story of Mari Smith ’85, an honors studio art graduate, and the painted self-portrait she gave to Reese. After he asked during her sophomore year, Smith quickly promised to give him a piece of her art. But it wasn’t until the Friday before her Monday graduation that she walked into his office, then in Chase Hall, and offered him the painting. Reese is especially known for his support of international students, and that’s why his office has a global feel. In fact, he’s accumulated so many tributes that he can display only about a third of them at any one time. Some are on permanent display, while others are rotated in. Like a true curator, Reese has designated a spot to showcase new objects. We recently found him installing an origami sculpture. “Hanging this is one of those important moments for this new office,” he says, recalling the student who, after suffering the death of a grandparent, had created the artwork to thank Reese for his support. The sculpture moved with Reese from his prior office, in Lane Hall, where it had a prominent place, and Reese wanted a similarly special spot for it in his Roger Williams office, where he is associate dean of students for international student programs in the Center for Global Education, formerly the Off-Campus Study Office. When Reese arrived at Bates in 1977, he met two first-year international students. “They gave me items for the office on the first day that I met them, as is the custom in several societies around the world. I was familiar with that, so I thanked them and put them on my desk,” he says. When some older international students met Reese the following week, they saw the gifts and decided that they, too, wanted to participate. And so the ritual began in earnest. “Whether it’s a small item or not, something that’s heavy or light, something that’s expensive or not at all — I do want to make sure the representations continue,” he says.